Having had Nike kits for 15 years in total between 1990 and 2009, and now clad in Puma since 2012, it’s easy to forget that, once upon a time, Borussia Dortmund wore adidas – like most German sides did. From 1974-90, die Schwarzgelben carried the three stripes on a variety of designs (with the occasional shirt made by adidas’s sub-brand Erima). 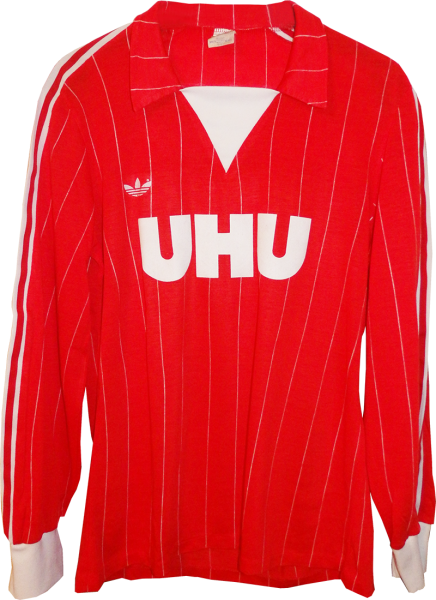 For much of that period, red – usually the colour of Bayern Munich – was favoured as an away choice, and also like Bayern, there was a high level of promiscuity as regard the style of shirts. For much of the 1988-89 season, Dortmund wore a yellow version of the template used by the Netherlands in winning Euro 88, having reached the final of the DFB-Pokal (domestic cup), they came up something different. Essentially the same design of shirt as would be used by Colombia in the World Cup a year later, it featured the adidas logo rendered very small, with the trefoil alongside the wordmark, as sometimes seen on the firm’s goalkeeper shirts in the 1980s. The change did Dortmund good as they came back from the concession of an early goal to beat Werder Bremen 4-1, ending a 24-year wait for a major trophy, paving the way for more success in the 1990s.